Imagine giving your dad, husband or friend a copy of our bestselling book featuring him on the front cover! It also includes a personalized dedication from you on the back. It’s a custom gift he’ll treasure forever! The best gift for Dads! Recipient’s name and photo along with a short personal message from you. Select a quote and add your personal message and signature. Buy our bestselling book without personalization. When you’re searching through the hundreds of gifts for dads that various stores sell, we know that you you want something unique…something that stands out from the crowd. You want a gift the Dad in your life will remember as the best gift he ever received. 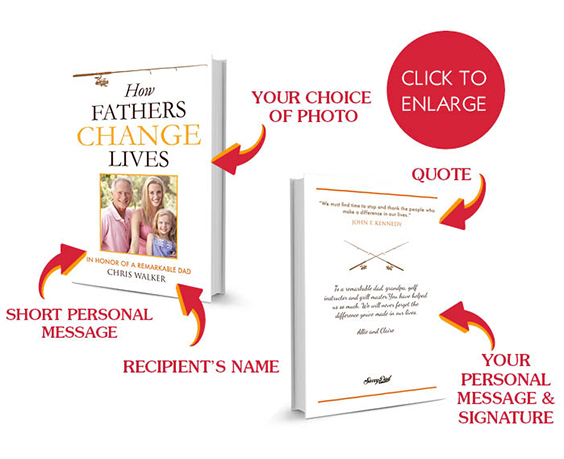 When you want the very best gift for dad, give him our personalized bestselling book, “How Fathers Change Lives”.